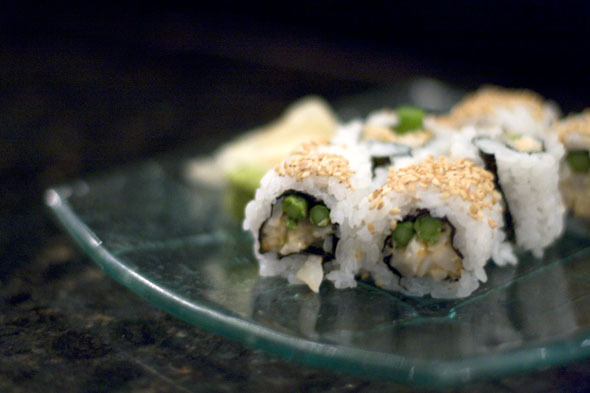 Toronto is a city of sushi for the masses. It's cheap and plentiful ; there seems to be at least one shop on every block. Even I need my weekly fix. My "Sushi Sundays" as I like to call them, are the perfect ending to the weekend because it's become so affordable, especially as take out. I was introduced to Ki while working in the downtown core ; being blessed with company lunches and an expense account for client interaction , I used every opportunity to dine there. 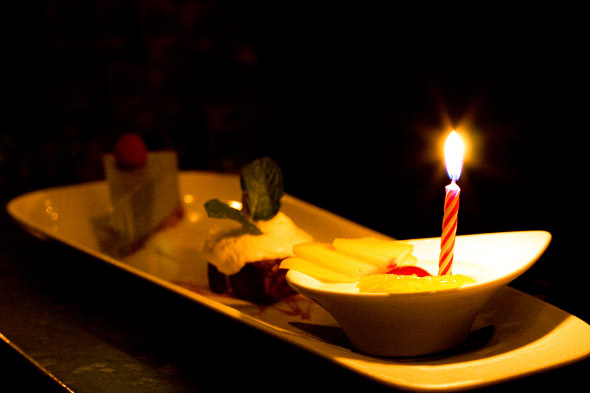 When I moved to an office in midtown, my downtown coworkers were kind enough to send me off with a Ki gift certificate, knowing that I'd never likely spend the money to eat there again. So, a year later I returned to see if Ki still deserved my endless affection. I decided my friend's 28th birthday was special enough to splurge on Ki, and thankfully I wasn't spending my own money. The place was packed on a Wednesday night. The bar was lined with a sea of suits and alluring young things that made me feel like I should have included more cleavage in my wardrobe repertoire. Without a reservation and the tables all taken, we were guided to the sushi bar with its high back chairs which made the setting intimate enough to gossip about the other patrons while talking to the sushi chefs about what they were charring with a blow torch. After perusing the menu our server Geoff greets us and asks if we'd like something to drink. After asking what's popular, he points with disdain to the pomegranate martini but is quick to mention the newest creations, knowing that just because pomegranate is the cosmo du jour with the after work crew, that doesn't make it great. We decided to share a number of dishes so that we could sample the vast menu. 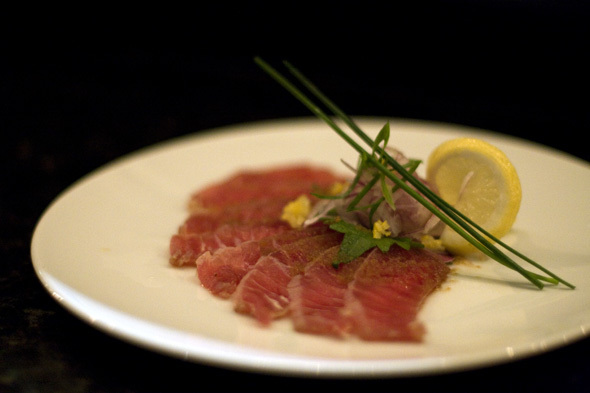 After a considerable but justifiable wait, the Tuna Carpaccio with Onion, Dressed with Oba-Yuzu Kosho ($12) arrives. 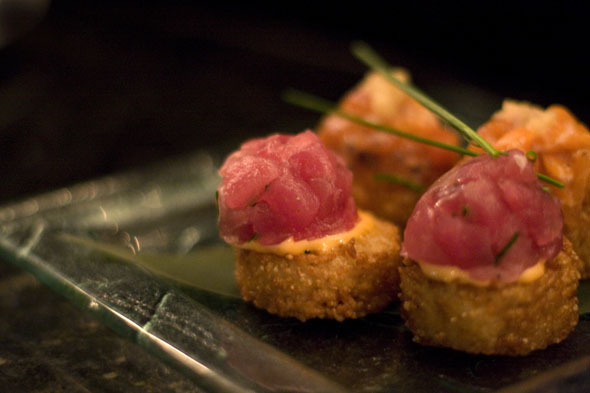 The tuna was flawlessly dressed with acidity to complement its fresh buttery texture. I knew we were off to a good start. I had suggested we order the Spicy Tuna and Salmon on Crispy Rice Cakes ($10) but was disappointed at first sight. I love sushi pizza; I often order it. But please, if you are going to offer individual sushi pizza coins, there's no need for a modern twist to the name. While I appreciate that the kitchen gave us generous portions of salmon and tuna, it was difficult to eat and the mountain of fish and the salmon was bland save for the fresh ginger on top. The assorted Seafood Classic Tempura ($19) was served with a creamy roasted garlic dip (note to menu author: thank you for not calling this aioli). Generally I stay away from deep fried food unless it's at a greasy spoon. As far as I'm concerned, a deep fried boot would likely taste the same as deep fried battered shrimp - in the end all deep fried food pretty much tastes the same. 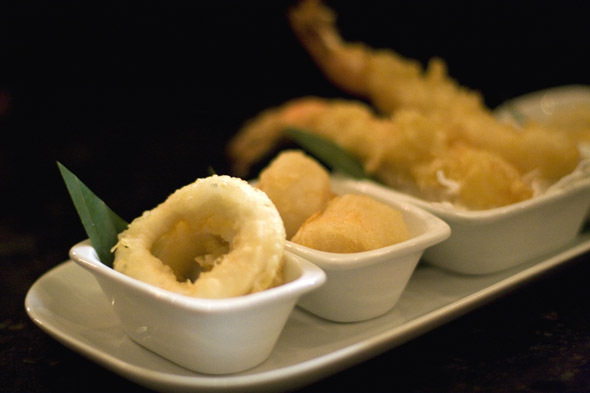 While not a generous portion, the lightly coated tempura featured wonderfully delicate scallops. The shrimp was also tender without the greasiness expected with tempura. I was surprisingly disappointed with the calamari, which appeared to be deep fried at too low a heat as it lost all tenderness in favour of a gummy texture. With the sage advice from Geoff, we ordered the Canadian AAA Tenderloin, Grilled with Garlic Soy, served with Sesame and Red Wine Soy Dips ($28). I was a bit skeptical about ordering a signature hot plate but the dish did not disappoint; a generous portion of luscious beef arrived and I wished I had the stomach of a lumberjack to devour the entire dish. The only hiccup was the dips. Do we require dips for everything? I sampled the dips but pushed them aside as the beef was good enough on its own. 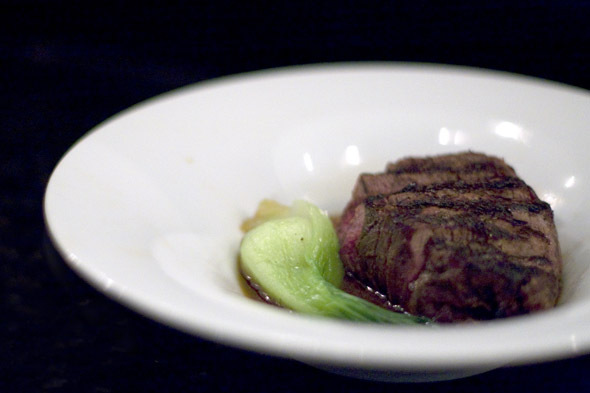 I did not need a red wine demi-glace or sesame/soy dip to mask its hearty flavour. While the gems of the menu are the hot and cold plates, we also chose the Tobiko, Spicy Mayo, Asparagus, and Minced Sea Scallop Makimono ($14) from the more traditional side of the menu. The tobiko was noticeably absent; however, the fresh flavour of the sea scallop was enough to set it apart from anything I'd had on a Sushi Sunday. Geoff attempted to steer us away from dessert, explaining that while the Dufflet concoctions were satisfactory, they weren't elevated to the same experience of the main courses. However, the birthday girl wanted cake and ordered the Trio of Cheesecake ($10) which included green tea, mascarpone and rare lemon. As a great server would, Geoff brought it out with a candle and advised that I would need to be the musical talent. The sushi chefs wished her a happy birthday and she blew out the candle. Afterwards she admitted that Geoff was right, it was a lackluster dessert. Heeding Geoff's advice, I chose another signature cold plate. I shared my disappointment that the Two Way Tartar was no longer on the menu. He adeptly suggested that for my "dessert" I should try the Toro Tower topped with crispy shallots and garlic ponzu dressing ($16). Again he was spot on. 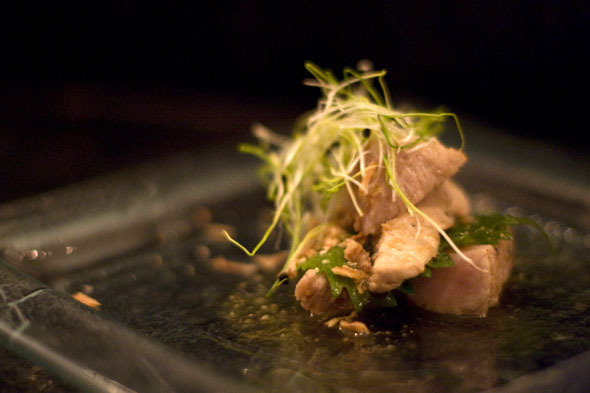 While I thought I had my fill of tuna that night, the taste was transformed with the tart, citrusy ponzu sauce. The crispy shallots were nonexistent - so much for consistency. At the end of our meal Geoff appeared with a small box with two homemade chocolate truffles. Ki is located at 181 Bay St in Brookfield Place (formerly BCE place). The restaurant is open Mon-Fri 11:30 am-1 am, Sat 4 pm-1 am.